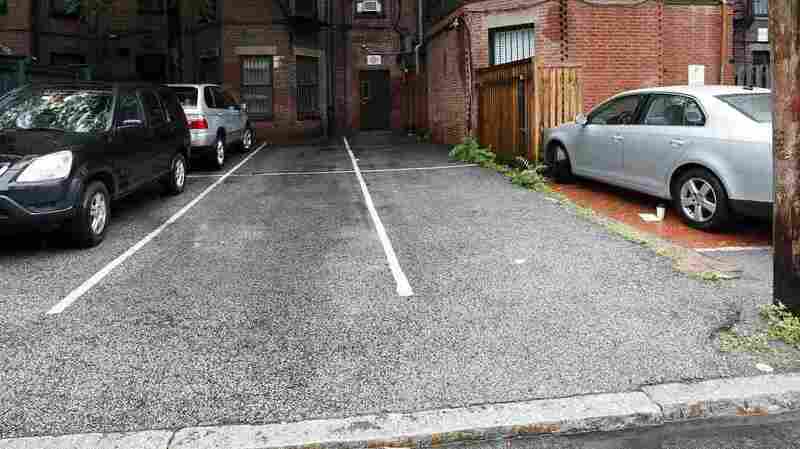 The Parking Spots That Cost More Than Half A Million Dollars : The Two-Way Question: If the median price for a single-family home in Massachusetts is $313,000 and two Boston parking spaces sell for $560,000, how many other spaces does the buyer already have? Answer: Three. Parking spaces behind 298 Commonwealth Avenue in Boston are seen Friday. The two open spaces at right, front and back, were sold at auction for $560,000. As it turns out, prime urban parking can be almost as valuable as a single-family home. A Boston woman bought two parking spaces for $560,000 at auction Thursday, winning a tough bidding war that increased by the tens of thousands at each turn. The buyer, Lisa Blumenthal, said the spots will be used for guests and workers, at the hefty price of $280,000 each — nearly 90 percent of the worth of the median sales price of a single-family home in Massachusetts. The price tag for the spots on Boston's Commonwealth Avenue comes close to, but doesn't break, the record for a single parking spot. Five blocks away on Commonwealth, a single spot sold for $300,000 in 2009. "Two tandem spots a block from the Public Garden on Commonwealth Avenue sold for $200,000 last summer, and a spot on Marlborough Street went for $250,000 in December, according to the real estate firm Cabot & Co."
Boston's not the only hub for the business of parking; a spot in San Francisco sold for $82,000 last week, perhaps an indicator of the city's strong housing market. As property prices climb, so do parking space values. In its annual report of parking rates, Colliers International ranked Boston and San Francisco fourth and fifth, respectively, on the list of most expensive monthly parking costs in North America. The two cities only fall behind New York's Midtown and Downtown areas, and Calgary, Alberta, Canada.